The lights are set to go out on the final showdown of the 2017 MotoGP Championship in Valencia in just a few hours, so here are a few crucial facts and stats ahead of the 18th and final race of the season from MotoGP’s stats genius, Dr Martin Raines. In his years in Grand Prix racing, Dr Raines has compiled 307 pre-race guides, and this ‘Sunday Guide’ to Valencia, is his last before he retires. Marc Marquez is on pole for the eighth time in 2017. He is aiming to become the youngest ever rider to win four premier-class world titles. In second place on the grid is Johann Zarco, which is his fourth successive front row start. He is aiming to be the first satellite team rider to win in his rookie season in the premier-class since Valentino Rossi in 2000. Andrea Iannone is back on the front row for the first time since the opening race of the year in Qatar. Iannone finished third last year in Valencia when riding for Ducati, which is the Italian manufacturer’s only podium at this circuit in the last six years. 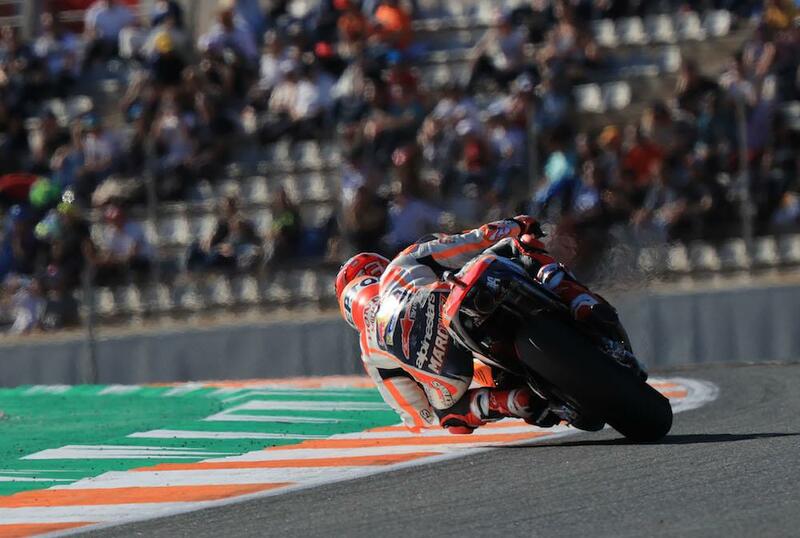 The MotoGP race in Valencia has only once been won by a rider who has not qualified on the front row, which was when Marc Marquez won from fifth place on the grid in 2014. Jorge Lorenzo heads the second row on a Ducati, making it four different manufacturers filling the top four places on the grid. Lorenzo has won in Valencia three times in the last four years. Triple Valencia MotoGP winner Dani Pedrosa has qualified in fifth place on the grid. Pedrosa is scheduled to make his 277th GP start, which moves him into a clear fourth place above Alex Borros in the all-time Grand Prix start list. In sixth place on the grid is wildcard rider Michele Pirro, who took his only Grand Prix victory in the Moto2 class in Valencia in 2011. Heading the third row is Valentino Rossi, who has competed in all 18 grand Prix events that have taken place at the Valencia circuit. Aleix Espargaro, who has qualified in eighth position, made his Grand Prix debut in the 125cc class at Valencia circuit in 2004 at the age of 15. Championship challenger Andrea Dovizioso starts from ninth place on the grid, which is the same qualifying position from which he won the Japanese Grand Prix four weeks ago. Danilo Petrucci, who has qualified in 15th position, is scheduled to make his 100th Grand Prix start, all of which have been in the MotoGP class. Alex Marquez is on pole for the third time in 2017, all of which have been achieved at Spanish tracks, following poles in Jerez and Circuit de Catalunya. He won both of those races. Franco Morbidelli starts from second place on the grid, which is his 14th front row start of the year. He is going for his ninth win of the year, which will equal the record for most wins in a single season in the Moto2 class. That was achieved by Marc Marquez in 2012. Mattia Pasini starts from the front row for the 10th time in 2017. Pasini’s only podium finish in Valencia is in the 125cc class back in 2005 when he finished third. Heading the second row is Miguel Oliveira, who is aiming to win his third successive Moto2 race. The last time a non-Kalex rider won three successive Moto2 races was Marc Marquez on a Suter in 2012. Brad Binder, who won the Moto3 race at Valencia last year, starts fifth. Completing the second row is Dominique Aegerter, who finished third in the Moto2 race in Valencia back in 2011, which was his first podium in Grand Prix racing. Jorge Martin is on pole for the ninth time this season, which is the highest number of poles achieved in a single season in Moto3. It is also the highest by a rider in the lightweight-class since Marc Marquez was on pole 12 times in 2010 in the 125cc class. Martin will be aiming to take his first Moto3 race win in what will be his 50th Grand Prix start. In second on the grid is Joan Mir, who is aiming to win his 11th race of 2017 to equal the record for most wins in a single season in the lightweight class of Grand Prix racing, which was set by Valentino Rossi in 1997. The 125cc win by Dani Pedrosa in 2002 is the only win in the lightweight class in Valencia by Honda. The highest placed KTM rider on the grid is Gabriel Rodrigo, who starts from the front row for the fifth time in 2017. He is still looking to finish on the podium for the first time. Heading the second row is Tatsuki Suzuki, which is his best qualifying result in what is his 54th start in the Moto3 class. In fifth place on the grid is Enea Bastianini, who has finished on the podium three times in the last six races and was fourth last year in Valencia, finishing just 0.147 seconds behind race winner Binder. Heading the third row is Ayumu Sasaki, which is the best qualifying result of the rookie year. Sasaki is the leading rider in the battle for Moto3 Rookie of the Year with a nine-point advantage over Marco Bezzecchi.